We are pleased to have Craig Halloran among our stable of talented authors. Recently we published his work, The Darkslayer, Volume One, and we are proud to have him among our page turners. He is an entertaining fellow and you might want to take some time to learn more about him and his ventures at his site. Mr. Halloran lives with his family near his hometown of Charleston, West Virginia. He is a graduate of West Virginia University and is a United States Air Force Veteran. When he isn't writing, he enjoying adventures with his family and friends, watching sports, working out and fishing. Quote by Craig: "Be your own hero, I've got things to do." "Do as they say or die in the dungeons," the poor store keepers would say. "Do as they say or disappear," the commoners would warn. But Venir and Melegal could not have cared less what anyone had to say. They had been this way since thier childhood. As the underlings rally all of the evil forces they can muster to destroy the mystical and legendary Darkslayer, something unexpected has upset the delicate balance between good and evil on the world called Bish, making the Darkslayer a pawn in other insidious disputes. "The Darkslayer if the monolith of sword and sorcery that blots out modern fantasy like an eclipse." "Harry Who? The Darkslayer Rules!" "They say, you can't judge a book by the cover, so you better not put this one down." "The surprise is always on the inside and what a surprise this is!" "It's about time someone wrote a story that grabs evil by the neck and smashes it in the face!" "Hooray for Halloran! He did it his way and it's right!" "Why can't more books be like this? Good stuff." "Wow! A book with some pictures, it's about time! Thanks Craig!" "Please tell me that this is only the beginning...I need more!" "Finally, somebody understands that fantasy is not for sissies!" "Who said Sword and Sorcery was dead? I can't hear you!" "A fantasy you pick up and can't put down! Nice." "There are a lot of fantasy's out there, but I swear this is the first of it's kind." 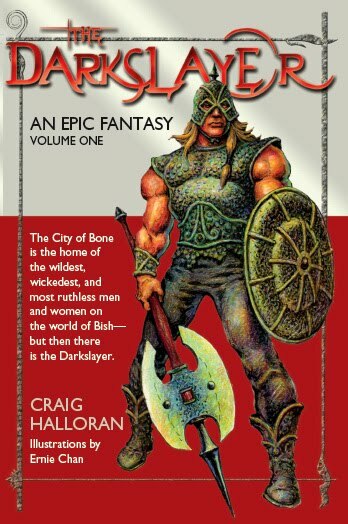 "Hey Craig, your next book should be, How to publish a great fantasy for dummies. You rule!" "Brutal and imaginative. Pretty Cool." "In the twilight hour I cried, 'Give me more!'" "My eyes! My eyes! I can't believe my eyes!" "Man, I have one chapter left and I still don't know how it's going to end." "I sleep better at night knowing that the Darkslayer is hunting the evil that haunts me." "I finally understand, my in-laws are underlings." "Apparently Mr. Halloran has plenty of fresh ideas." "Bloody and funny? How can that be?"